Well, according to the Lonely Planet and Google, there is petrol… but it is in Tashkent (the capital), a 15-hour, 1,100km drive East, and not on our planned route. Not much good when you arrive in Nukus in the North West of Uzbekistan, and discover there is not a single working petrol station in the entire region. Luckily we’d filled Martha up in Turkmenistan, just before we crossed over the border. Not so much because we were aware of the chronic lack of petrol, more because, at about 6p per litre, petrol in Turkmenistan was unbelievably cheap, and we didn’t think it could get much cheaper. 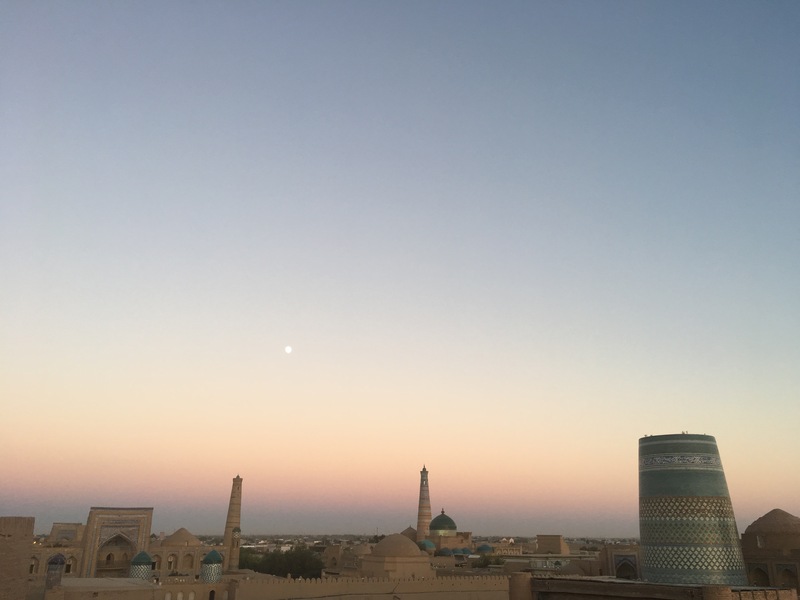 We arrived in Nukus in the late afternoon, and having had no wifi for the last few days, relied on our guidebook to take us to a reasonably priced hotel. Nukus wasn’t a particularly attractive city, but it was just over the border and a good place to base ourselves for a little detour up north to visit what used to be the Aral Sea. 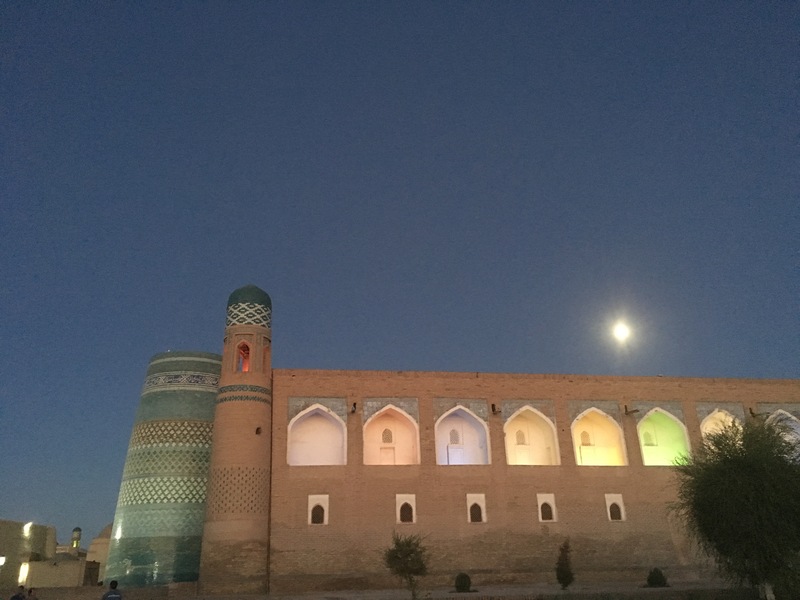 We were staying with two other teams who had followed us to Nukus from the border, and decided to go out for dinner together at a restaurant recommended by the hotel. The food was quick, tasty and filling… but then we got the bill. At the equivalent of $35 for six people (main courses, sides, and many drinks), it wasn’t exactly expensive, but the restaurant would only accept local currency, and we didn’t have enough. This is the second problem with Uzbekistan: not only is there no straightforward way to get petrol, there is also no easy way to get money. Hotels and hostels will ONLY accept payment in US dollars, while most other places will ONLY accept payment in local currency (the Uzbek Som). Nowhere accepts credit cards. You need to carry both US dollars and Uzbek Som with you at all times. THere are also no working ATMs (or at least, not in the places we’ve visited), and no official currency exchange offices. If you want local money, you have to buy it on the black market. 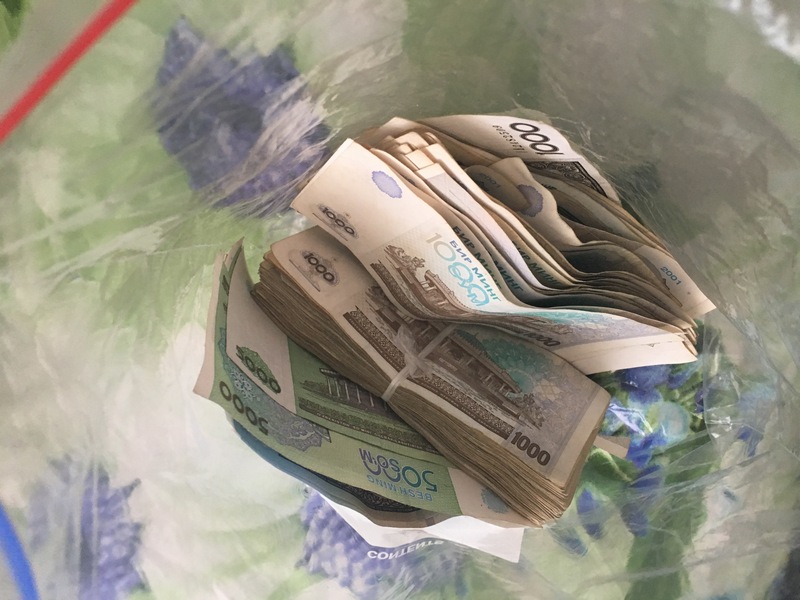 The Uzbek Som is also a bit ridiculous: the “official” rate is about 4,000 som to the dollar, and the black market rate (really the only rate, since there are no or limited “official” ways to change money) is about 8,000 som to the dollar. Either way, we struggled to change more than $20 at a time, because no one had enough notes of the local stuff to change any more. So, faced with a restaurant bill we couldn’t pay, Shane and I traipsed around Nukus looking for someone who might change our dollars. We looked for a bank, or ATM of any kind. There were banks, but they were closed, and an ATM was an alien concept. We looked for a hotel, and found a couple, but both refused to do a deal. Eventually we met a local man in a hotel lobby who helped us out and gave us a decent rate. We went back to the restaurant, and triumphantly handed over a giant wad of cash to pay the bill. 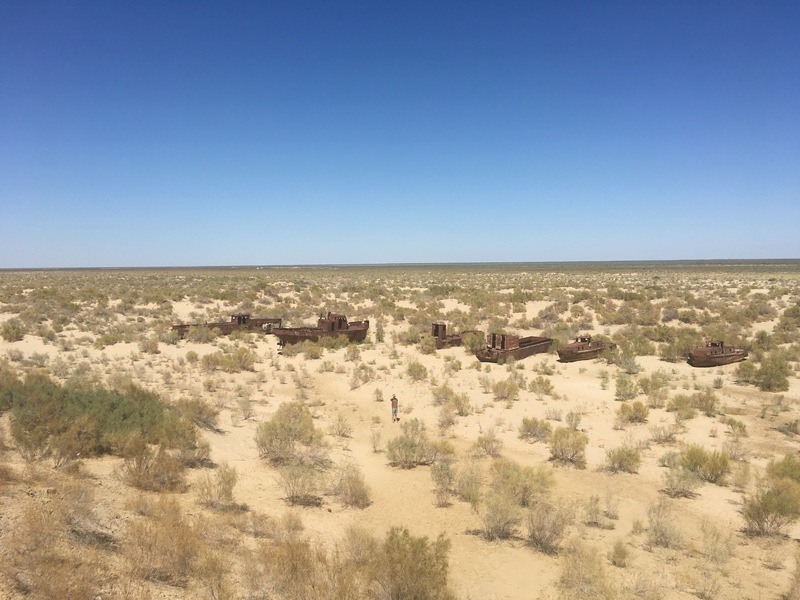 The next day we drove 200km north of Nukus to visit Moynaq, and a big desert which used to be home to the world’s fourth largest lake – the Aral Sea. Moynaq was once a busy port city on the edge of the Aral Sea. Its main industries were fishing and canning, and it was home to tens of thousands of people. 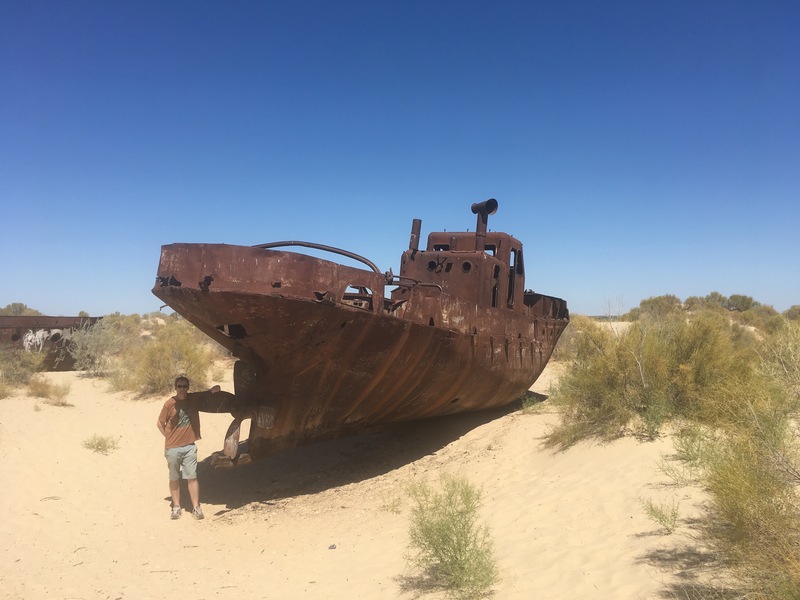 In the early 1960s, the Soviet government decided to divert the two rivers that fed the Aral Sea to irrigate the desert, in an attempt to grow rice, melons, cereals and cotton. Many of the irrigation canals were poorly built, so lots of water leaked and evaporated. 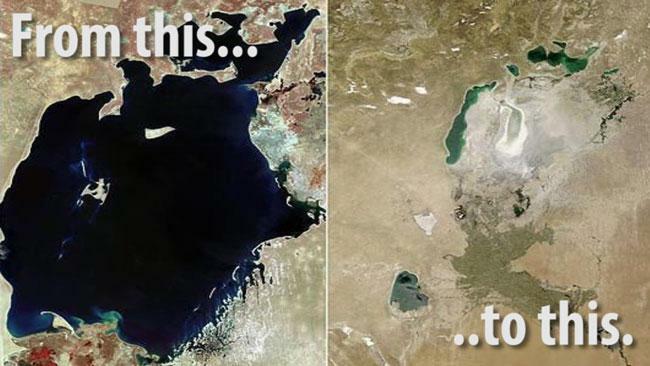 The Aral Sea began to shrink. By 2007, the Sea was only 10% of its original size. This has been a disaster for Moynaq. The fishing and canning industries have collapsed, leading to an economic disaster. The area is severely polluted by agricultural chemical runoff and toxic chemicals left behind as the sea has shrunk. There are frequent toxic dust storms, and the weather has become more extreme. All in all, it’s not a great place to be. 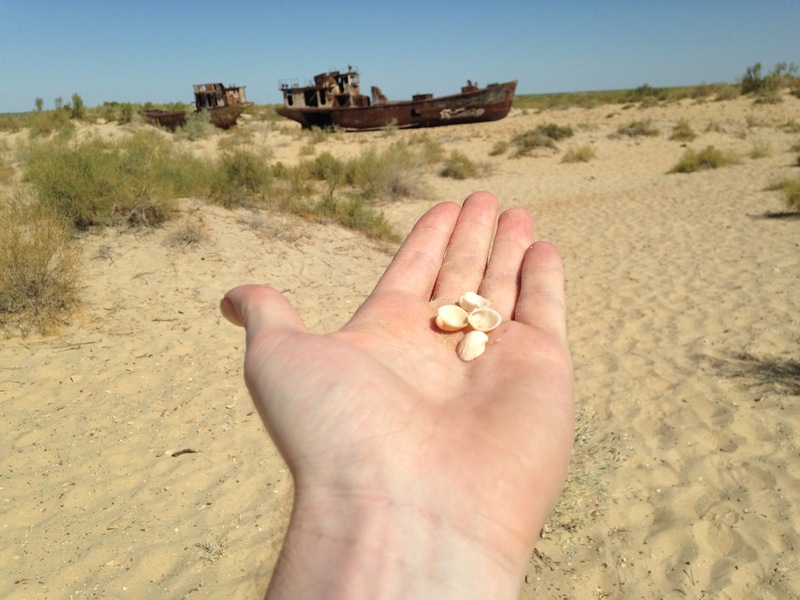 When we arrived in Moynaq, we found a ghost town, a monument to what used to be the Aral Sea, and a vast desert. There was no water – the Sea was now nearly 200km away – but there were seashells in the desert, and a sort of ship graveyard. A number of old, rusty ships were still sitting in what used to be the sea. Now they were stuck in the desert. 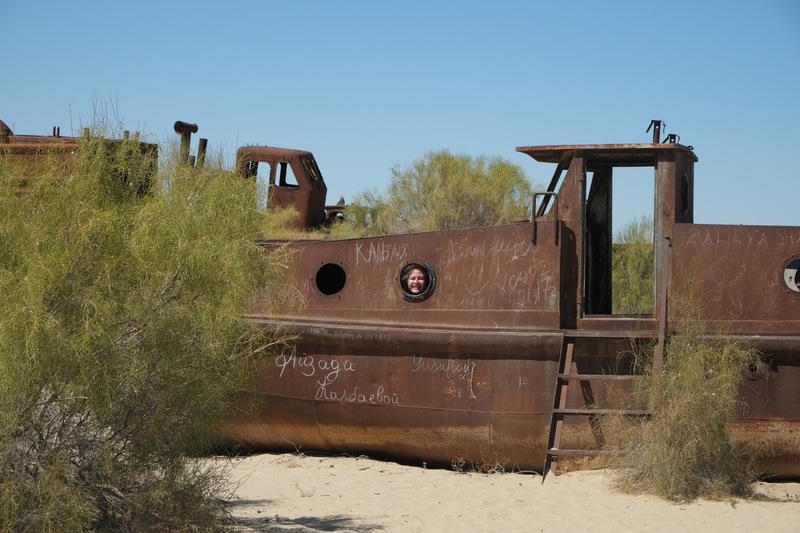 We explored the old seabed and the ships, and experienced the extreme weather conditions the town faces first hand – the temperature was the hottest it has been on our trip so far, and after days of 40+ degrees in Turkmenistan, that is saying something. We arrived back in Nukus in the evening, and realized we had a problem. We had used up a large amount of our petrol, and had no way to get more. There were lots of fuel stations in Nukus, but they only sold propane or methane gas. We did some research back at our hostel, and quickly discovered that there were not likely to be any working petrol stations outside of Tashkent. We needed to buy some “black market” petrol. Luckily, the lady who worked in our hostel said her mother could help us. At 5,000 Uzbek Som (about 50p) per litre, she warned us that it was “very expensive”, but compared to petrol prices back home, this seemed alright to us. The next morning, an older lady joined Shane in Martha and they drove a good 10km to a house on the side of the road, and bought some dodgy looking petrol which came in some five litre water bottles. It wasn’t ideal, but we didn’t have much choice. With Martha full of something, we continued with our journey. 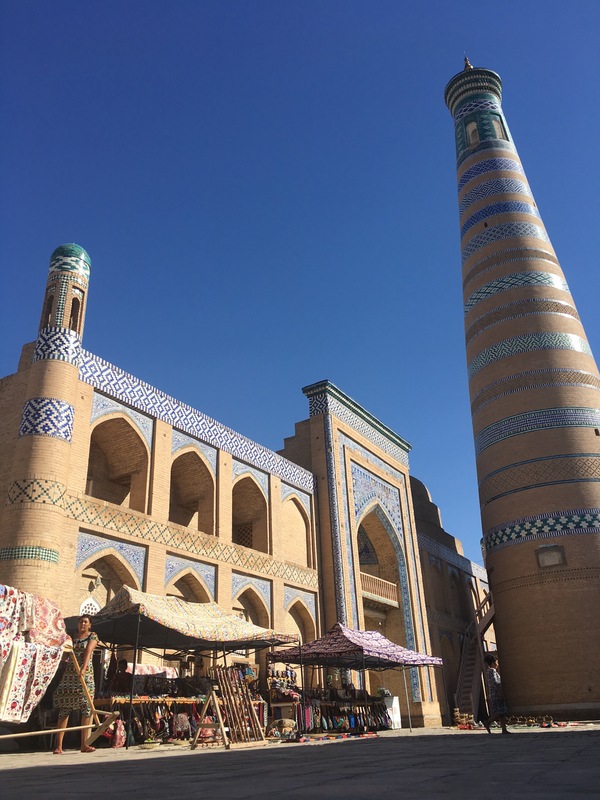 Our next stop was Khiva: a small, old Silk Road town with some very beautiful and well preserved architecture. We wandered around the old buildings and watched the sunset from an ancient watch tower, looking over the town. The next morning we repeated the search for money and petrol. This time, I was able to change money with our hotel and Shane went on a short drive with the hotel owner’s son to get some petrol. “Do you want the good fuel or the bad fuel?”, he asked. “Good fuel! Good fuel!”, we replied. It was probably still pretty bad fuel, although things could have apparently been worse. 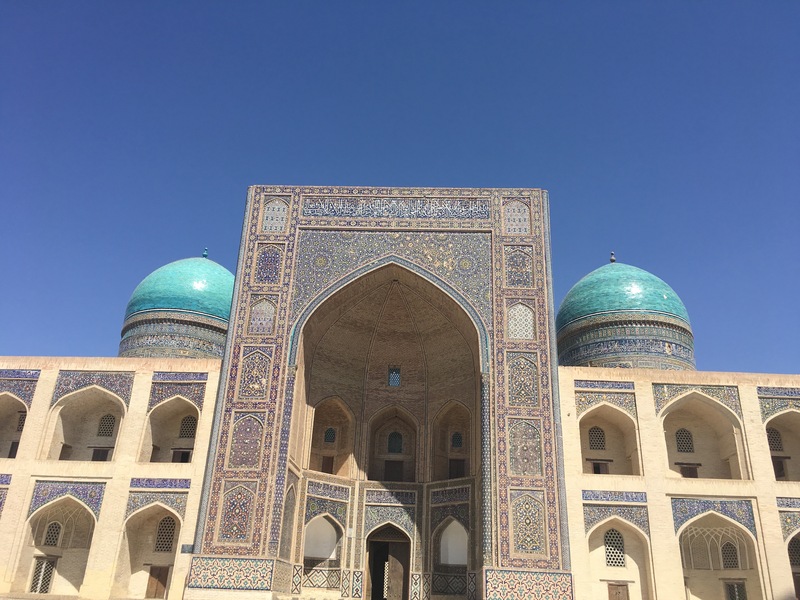 Loaded up with more elusive petrol, we drove to Bukhara – Central Asia’s holiest city – which felt more real and lived in than Khiva. The centre was a bit of a building sight but we had a relaxing day off wandering the sights and soaking up the sun. Eventually we found Lyabi-Hauz, a cool oasis with a big pool of water in the heart of the city, and a number of other Mongol Rally teams. 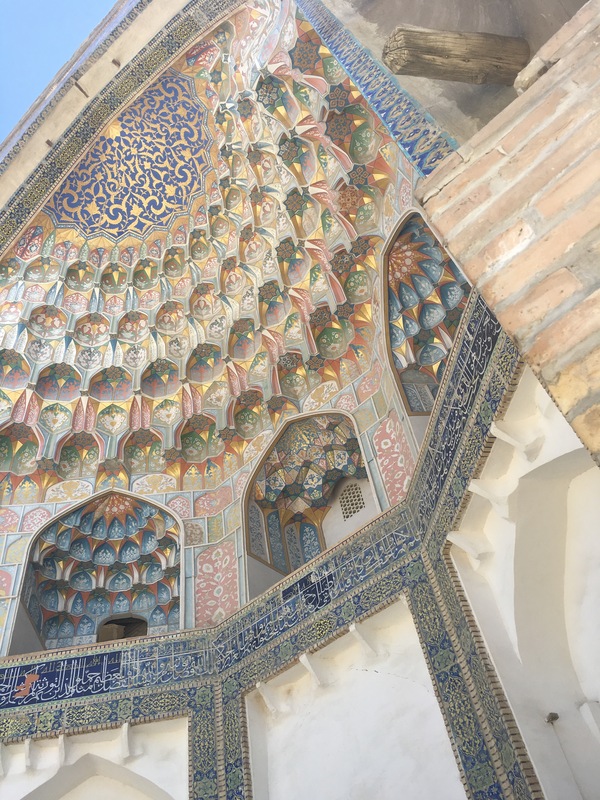 Our last stop in Uzbekistan was Samarkand. Another town filled with impressive buildings and minarets. We stayed in a dilapidated and interesting guesthouse. The owner was very friendly and helpful, insisting we have some tea and some peaches as soon as we arrived, and then insisting we have some melon. The fruit was never ending. When we went through the usual routine of asking about petrol and money, he went out of his way to help us – driving us all over the city looking for petrol. Eventually we found some petrol and some local money. We had enough supplies to take us to Tajikistan, where we hoped that paying for things and giving Martha a drink wouldn’t be quite so challenging. Of course, Uzbekistan had a couple more twists in store for us before we could continue on our way. The closest border between Samarkand in Uzbekistan and Dushanbe in Tajikistan turned out to be closed, so we had to drive a less direct route – through some more desert and some mountains – down to the border with Afghanistan. We managed to find a shortcut which saved us some time, but were stopped again and again by Police. The last time we were stopped, the police officer told us the road we had chosen was closed. We would need to drive 100km back to the main road, and then go the long way round. All in all, this would probably add an extra six hours and 300km to our journey. We’d started at 6am and it was already 3.30pm. We were tantalizingly close to the border. After much toing and froing, eventually the police officer let us continue along the route we had planned. It turned out there were no road closures, and no reason why we needed to turn back. Was the police officer confused? Was he having a joke? 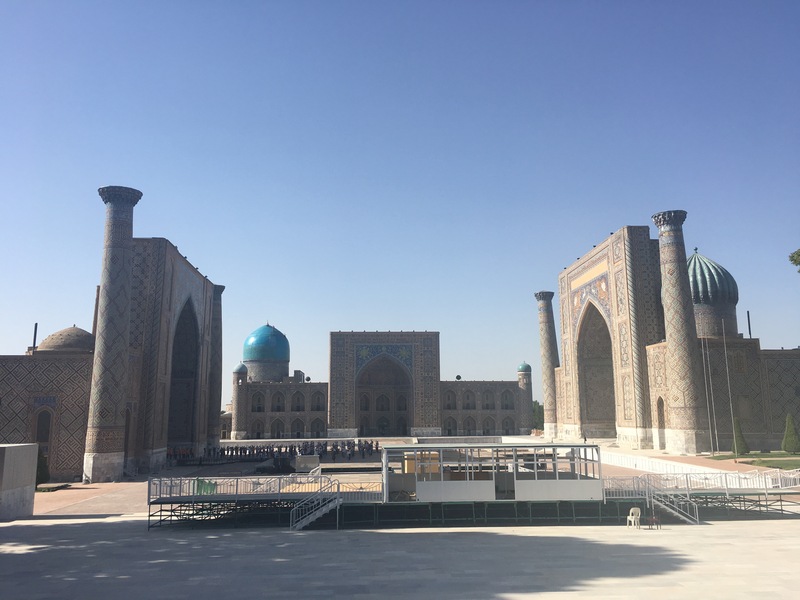 We had no idea, but after another painful experience trying to get through border control, and Martha’s engine starting to make a strange noise because of the dodgy fuel she’d been drinking, we were ready to say goodbye to Uzbekistan. Despite its beautiful architecture and very industrious and helpful people, we were dreaming of a land with readily available, high quality (or at least medium quality) petrol, and cash machines. Will we find it in Tajikistan? We’ll find out!